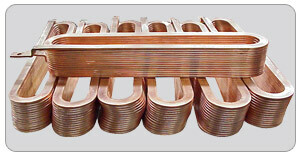 Stimple & Ward Company is one of the first independent manufacturers of edge wound coils. We have extensive capabilities in manufacturing all types of edge wound coils, from small blowout coils weighing ounces to large turbine rotor coils weighing hundreds of pounds. We edgewind copper from .032" x 0.375" through .750" x 3.000". 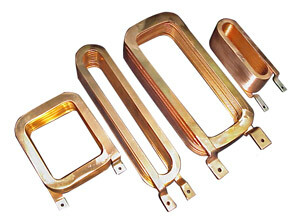 Edge wound literally means that the coil is wound on the edge of the copper wire and not the flat or round side, thus the term edge wound coil. Our in house bright annealing furnaces allow us to maintain tight control over the temper of the copper while maintaining a clean oxidation free surface. This process gives us the means to press form the edge wound coil after winding to maintain specified dimensions and tight turn consolidation in the finished product. 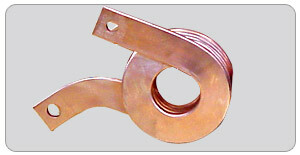 Copper Dimensions .32"x.375" Through .750" x 3.000"
Coil Dimensions Round: Up to 16" I.D. Rectangular / Square: Up to 24" x 144"